President Obama has displayed a stunning lack of sympathy for the Russian civilians killed in an ISIS plane bombing in Egypt and for two Russian military men slain as victims of U.S. weapons systems in Syria, putting insults toward President Putin ahead of human decency, writes Robert Parry. Normally, when a country is hit by an act of terrorism, there is universal sympathy even if the country has engaged in actions that may have made it a target of the terrorists. After 9/11, for instance, any discussion of whether U.S. violent meddling in the Middle East may have precipitated the attack was ruled out of the public debate. Similarly, the 7/7 attacks against London’s Underground in 2005 were not excused because the United Kingdom had joined in President George W. Bush’s aggressive war in Iraq. The same with the more recent terror strikes in Paris. No respectable politician or pundit gloated about the French getting what they deserved for their long history of imperialism in the Muslim world. But a different set of rules apply to Russia. Along with other prominent Americans, President Barack Obama and New York Times columnist Thomas L. Friedman have expressed smug satisfaction over the murder of 224 people aboard a Russian charter flight blown up over the Sinai and in the slaying of a Russian pilot who had been shot down by a Turkish warplane and the killing of a Russian marine on a rescue mission. Apparently, the political imperative to display disdain for Russian President Vladimir Putin trumps any normal sense of humanity. Both Obama on Tuesday and Friedman on Wednesday treated those Russian deaths at the hands of the Islamic State or other jihadists as Putin’s comeuppance for intervening against terrorist/jihadist gains in Syria. At a news conference in Paris, Obama expressed his lack of sympathy as part of a bizarre comment in which he faulted Putin for somehow not turning around the Syrian conflict during the past month – when Obama and his allies have been floundering in their “war” against the Islamic State and its parent, Al Qaeda, for years, if not decades. In examining that one paragraph, a “fair-minded” reporter could find a great deal to dispute. Indeed, the comments suggest that President Obama has crossed some line into either believing his own propaganda or thinking that everyone who listens to him is an idiot and will believe whatever he says. But what was perhaps most disturbing was Obama’s graceless manner of discussing the tragedy of the Sinai bombing, followed by his seeming pleasure over Turkey shooting down a Russian SU-24 last week, leading to the killing of two Russian military men, one the pilot who was targeted while parachuting to the ground and the other a marine after his search-and-rescue helicopter was downed by a TOW missile. Even more troubling, the key weapon systems used – the Turkish F-16 fighter jet and the TOW missile – were U.S.-manufactured and apparently U.S. supplied, in the case of the TOW missile either directly or indirectly to Sunni jihadists deemed “moderate” by the Obama administration. Columnist Friedman was equally unfeeling about the Russian deaths. In a column entitled “Putin’s Great Syrian Adventure,” Friedman offered a mocking assessment of Russia’s intervention against Sunni jihadists and terrorists seeking to take control of Syria. While ridiculing anyone who praised Putin’s initiative or who just thought the Russian president was “crazy like a fox,” Friedman wrote: “Some of us thought he was just crazy. Well, two months later, let’s do the math: So far, Putin’s Syrian adventure has resulted in a Russian civilian airliner carrying 224 people being blown up, apparently by pro-ISIS militants in Sinai. Turkey shot down a Russian bomber after it strayed into Turkish territory. And then Syrian rebels killed one of the pilots as he parachuted to earth and one of the Russian marines sent to rescue him. Ha-ha, very funny! And, by the way, it has not been established that the Russian SU-24 did stray into Turkish air space but if it did, according to the Turkish account, it passed over a sliver of Turkish territory for all of 17 seconds. The evidence is quite clear that the SU-24 was ambushed in a reckless act by Turkey’s autocratic President Recep Tayyip Erdogan who has been collaborating with Syrian and foreign jihadists for the past four years to overthrow Syria’s secular government. And the murder of the pilot after he bailed out of the plane is not some reason to smirk; it is a war crime. The other wacky part of both Obama’s comments and Friedman’s echoes of the same themes is this quick assessment that the Russian intervention in support of the Syrian government has been some abject failure – as if the U.S.-led coalition has been doing so wonderfully. First, as a “fair-minded” reporter, I would say that it appears the Russian-backed Syrian offensive has at least stopped the advances of the Islamic State, Al Qaeda’s Nusra Front and its jihadist allies, including Ahrar al-Sham (which technically separates itself from Al Qaeda and thus qualifies for U.S.-supplied weaponry even though it fights side-by-side with Nusra in the Saudi-backed Army of Conquest). Obama’s reference to Afghanistan was also startling. He was suggesting that Putin should have learned a lesson from Moscow’s intervention in the 1980s in support of a secular, pro-Soviet regime in Kabul, which came under attack by CIA-organized-and-armed Islamic jihadists known then as mujahedeen. Wielding sophisticated surface-to-air missiles and benefiting from $1 billion a year in Saudi-U.S.-supplied weapons, the Afghan fundamentalist mujahedeen and their allies, including Saudi Osama bin Laden, eventually drove Soviet troops out in 1989 and – several years later behind the Taliban – completed the reversion of Afghanistan back to the Seventh Century. Women in Kabul went from dressing any way they liked in public, including wearing mini-skirts, to being covered in chadors and kept at home. Obama’s bringing up Afghanistan in the Syrian context and Putin’s supposed one-month Syrian failure was ironic in another way. After Al Qaeda’s 9/11 attacks, the United States invaded Afghanistan in pursuit of bin Laden and has been bogged down in a quagmire there for 14 years, including nearly seven years under Obama. So, Obama may not be on the firmest ground when he suggests that Putin recall Moscow’s experience in Afghanistan a few decades ago. After all, Obama has many more recent memories. Further, what is different about Putin’s Syrian strategy – compared with Obama’s – is that the Russians are targeting all the terrorists and jihadists, not just the Islamic State (also known as ISIS, ISIL or Daesh). While U.S. propaganda tries to present the non-ISIS jihadists as “moderates” (somehow pretending that Al Qaeda is no longer a terrorist organization), there is, in reality, very little distinction between ISIS and the alliance of Nusra/Ahrar al-Sham. And, as for Official Washington’s new “group think” about the Syrian government’s lack of progress in the war, there is the discordant news that the last of rebel forces have agreed to abandon the central city of Homs, which had been dubbed the “capital of the revolution.” The Associated Press reported on Tuesday that “thousands of insurgents will leave the last opposition-held neighborhood in” Homs, with the withdrawal beginning next week. Al-Jazeera added the additional fact that the remaining 4,000 insurgents are “from al-Nusra Front, Ahrar al-Sham and the Free Syrian Army.” In other words, the “moderate” Free Syrian Army was operating in collusion with Al Qaeda’s affiliate and its major jihadist partner. While it’s hard to get reliable up-to-date information from inside Syria, one intelligence source familiar with the military situation told me that the Syrian government offensive, backed by Iranian troops and Russian air power, had been surprisingly successful in putting the jihadists, including ISIS and Nusra, on the defensive, with additional gains around the key city of Aleppo. Also, in the past week, Putin shamed Obama into joining in a bombing operation to destroy hundreds of trucks carrying ISIS oil to Turkey. Why that valuable business was allowed to continue during the U.S.-led war on ISIS since summer 2014 has not been adequately explained. It apparently was being protected by Turkish President Erdogan. Another irony of Obama’s (and Friedman’s) critical assessment of Putin’s one-month military campaign came in Obama’s recounting of his meeting during the Paris climate summit with Erdogan. Obama said he was still appealing to Erdogan to close the Turkish-Syrian border although radical jihadists have been crossing it since the start of the Syrian civil war in 2011. In other words, all these years into the conflict – and about 1½ years since Obama specifically targeted ISIS – Turkey has not closed its borders to prevent ISIS from reinforcing itself with foreign fighters and trafficking in illicit oil sales to fund its terror operations. One might suspect that Erdogan has no intention of really stopping the Sunni jihadists from ravaging Syria. Erdogan still seems set on violent “regime change” in Syria after allowing his intelligence services to provide extensive help to ISIS, Al Qaeda’s Nusra and other extremists. The Russians claim that politically well-connected Turkish businessmen also have been profiting off the ISIS oil sales. But Obama’s acknowledgement that he has not even been able to get NATO “ally” Turkey to seal its border and that ISIS still remains a potent fighting force makes a mockery of his mocking Putin for not “significantly” changing the situation on the ground in Syria in one month. Obama also slid into propaganda speak when he blamed Assad for all the deaths that have occurred during the Syrian conflict. “I consider somebody who kills hundreds of thousands of his own people illegitimate,” Obama said. But again Obama is applying double standards. For instance, he would not blame President George W. Bush for the hundreds of thousands (possibly more than a million) dead Iraqis, yet Bush was arguably more responsible for those deaths by launching an unprovoked invasion of Iraq than Assad was in battling a jihadist-led insurgency. Plus, the death toll of Syrians, estimated to exceed a quarter million, includes many soldiers and police as well as armed jihadists. That does not excuse Assad or his regime for excessively heavy-handed tactics that have inflicted civilian casualties, but Obama and his predecessor both have plenty of innocent blood on their hands, too. 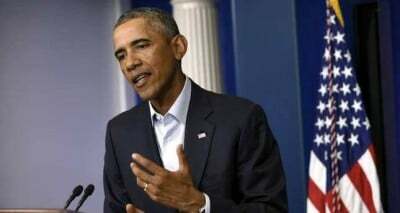 After watching Obama’s news conference, one perhaps can hope that he is just speaking out of multiple sides of his mouth as he is wont to do. Maybe, he’s playing his usual game of “above-the-table/below-the-table,” praising Erdogan above the table while chastising him below the table and disparaging Putin in public while cooperating with the Russian president in private. Or maybe President Obama has simply lost touch with reality – and with common human decency. Investigative reporter Robert Parry broke many of the Iran-Contra stories for The Associated Press and Newsweek in the 1980s. You can buy his latest book, America’s Stolen Narrative, either in print here or as an e-book (from Amazon andbarnesandnoble.com). You also can order Robert Parry’s trilogy on the Bush Family and its connections to various right-wing operatives for only $34. The trilogy includesAmerica’s Stolen Narrative. For details on this offer, click here.